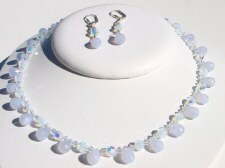 This simple necklace is so singularly dramatic with Chalcedony Briolette and crystals. It conveys elegance in every graceful turn. Necklace is 17" long and finished with Sterling Silver clasp. Earring is 1 3/4" with sterling silver leaverback findings. 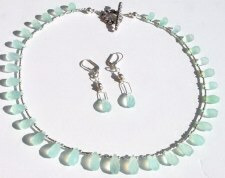 Aqua Chalcedony Briolette dominate this ensemble of carefree simplicity. Necklace is 16 1/2" long and finished with Sterling Silver toggle clasp. Earring is 1 3/4" with leaverback findings. Disclaimer: This information regarding the metaphysical and other properties and purposes of this mineral are provided for entertainment and inspirational purposes only. In no way is it intended for diagnosing illness, prescription, or advice and should not replace proper medical attention. Consult your Doctor or other health care practitioner regarding health issues. Creative Bead Designs is not liable for any use or misuse of this information.